Actor Leonard Nimoy portrayed the Vulcan "Spock" in the "Star Trek" franchise of television shows and films. He passed away on Feb. 27, 2015, at the age of 83. The death of "Star Trek" actor Leonard Nimoy has prompted an outpouring of condolences and heartfelt reflection from astronauts, scientists, celebrities and even President Barack Obama. People from around the world flocked to social media to honor Leonard Nimoy — made famous by his portrayal of the logical Vulcan Spock on the original "Star Trek" TV show — after his death was reported earlier today (Feb. 27). Even the president of the United States said he loved Spock. Nimoy, who died from end-stage chronic obstructive pulmonary disease, according to the New York Times, touched the lives of many space and science fiction fans through his role on "Star Trek." "Leonard Nimoy was an inspiration to multiple generations of engineers, scientists, astronauts, and other space explorers," NASA administrator Charles Bolden said in a statement. "As Mr. Spock, he made science and technology important to the story, while never failing to show, by example, that it is the people around us who matter most." Many space experts are also echoing Spock's famous words — "live long and prosper" — in their tributes to the actor. "Leonard, you lived long and prospered, and were an inspiration to me and to millions. Rest in peace," Canadian astronaut Chris Hadfield wrote on Twitter. 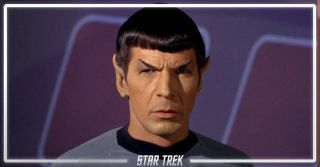 Although Nimoy was mostly involved in the science fiction realm, many engineers and scientists today cite "Star Trek" as something that influenced them. "Live Long and Prosper (LLAP) Leonard Nimoy, I already greatly miss you," planetary scientist Alan Stern, principal investigator of NASA's New Horizons mission to Pluto, wrote on Twitter. NASA astronaut Scott Kelly — one of two spaceflyers about to spend a full year on the International Space Station — also sent his thoughts via Twitter. "#RIP @TheRealNimoy who popularized #space travel for generations to come so we may live long and prosper," Kelly wrote, tagging Nimoy's Twitter in his post. Nimoy also worked with NASA to help promote the agency's missions. The actor narrated a video for the space agency about the Dawn mission, which will enter orbit around the dwarf planet Ceres next week. NASA also acknowledged Nimoy today with a Twitter post featuring a photo of the actor and his fellow "Star Trek" cast members with the space shuttle Enterprise. His cast members also came out to honor Nimoy via social media. "I loved him like a brother," William Shatner, who played Captain Kirk alongside Nimoy's Spock on the TV show, said via Twitter. "We will all miss his humor, his talent, and his capacity to love." "Today, the world lost a great man, and I lost a great friend," George Takei, who played Hikaru Sulu on the original series, said on Facebook. "We return you now to the stars, Leonard. You taught us to 'Live Long And Prosper,' and you indeed did, friend. I shall miss you in so many, many ways."